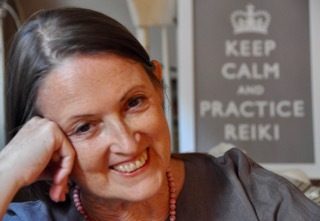 Many considerations come into play when integrating Reiki practice into conventional health care. My Reiki & Medicine Intensive would be very useful to you. I’m giving intensives in Vancouver at the end of July and Chicago area intensive in August. Animals respond to Reiki practice in the same way humans do, Joe. While we can never predict outcomes, I am sure you are helping your dog in many ways, and helping yourself as well. Would be best to practice on yourself and on him every day. Heart was fluttering. No longer. More relaxed. A little more relaxed is HUGE! ? Thank you for sharing your expertise. I live in a city where there are a lot of reiki practitioners, so my conversations about reiki are mostly with them. My clients are also reiki practitioners. Even though the presence of reiki practitioners is high, knowledge of reiki seems to be low. This webinar has helped me talk about reiki to people with little to no knowledge of reiki. I’m also interested in sharing reiki in NICU’s, so this conversation about medical reiki gives me a different way to approach doctors and nurses. Thank you, Pamela! It was a great help. I do self-healing every day and it has been a life changing for me. I have questions, hopefully, I will be able to address them in a future webinar. We are experiencing some concern here in ON, Canada. Our Minister of Health and the ON Premier are conspiring against all the spiritual practices and in favor of psychotherapist and counselors. If the bill becomes a law, we are going to experience chaos and trouble. I like to believe that change is always good and ultimately Light will prevail over darkness. Again, when are you coming to Toronto? is this an invitation? of course! Once more, thanks a lot! I’d be happy to return to Toronto. Why don’t you use the contact form on the top right and we can discuss possibilities? Thank you Pamela. Your comunication is so simple and clear that even a layman will have better understanding of the subject. I shall be eagerly looking forward for your next class. THANK YOU SO MUCH FOR CREATING AND GIVING THE GIFT OF THIS WEBINAR! You’re very welcome, Kathryn! Please share it with your Reiki community. Thank you reiki, n thank you Pamela for your speeches about Medical reiki ,and you elaborate so beautifully ,clearly. I am eagerly waiting for your another reiki sessions. Thank you.